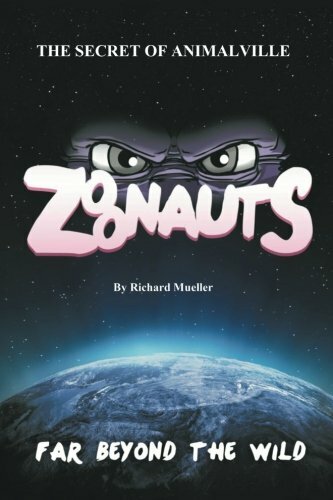 “Zoonauts: The Secret of Animalville: Far Beyond the Wild” by Richard Mueller is an adventure of intergalactic proportions, filled interesting animal characters. Each of these animals has been enhanced by a mysterious yellow light from alien origin. The light heightened the animal’s intelligence beyond the humans of earth, but the aliens forgot one thing: with intelligence comes understanding. These brave animals decide to use not only their new intelligence, but also the strange powers that came with it, to protect earth from the scaly and dragon-like Amadorians. Two of these mean spirited aliens have come to earth on a mission to retrieve Laika, one of the empowered animals, and take him to their leader. The story itself is a unique idea with a lot of potential, and even though the target audience is children, there's definitely some laughs to be had by adults as well. The other bonus to this story is just how informative it is. There is information on zoology, astronomy, history, and technology; which makes it a useful tool in a classroom. Everything about this story is good for the family, especially the message of equality and peace before war. My only grievance with “Zoonauts: The Secret of Animalville: Far Beyond the Wild” is really it's dialogue and writing. The story as I've said is informative, but lacks any real spice. The jokes and references are all dated, to the point I don't think kids today would understand them. The human characters all seem one dimensional, and most of the time, are just boring. One character specifically was almost straight out of an old-school cartoon. I'm talking about Major Prescott; this character was more than disappointing. His lines always seemed regurgitated or worse, simply boring. He also comes across as far more petulant and disrespectful than even the kids do. The kids themselves are your generic brother-sister duo, who are constantly bickering and pulling faces. Their parents just fall flat, without any real character. However, as I've already said, the animal characters are great, even if a couple characters get a little cheesy. "Zoonauts: The Secret of Animalville: Far Beyond the Wild" by Richard Mueller overall could be a really great book, or children's show, depending on how it comes to be. It is educational, would be entertaining for kids, and adults might even find it informative and fun. I really admire the messages in this story, they are certainly lessons that our kids should definitely learn. The multiple lessons are evident but not overt, and are well delivered, incorporated into the storyline perfectly. As a parent, I definitely think this show would be great for children.